The fungal forest pathogen Heterobasidion annosum has been introduced from North America into Italy and is now associated with high mortality of Italian stone pines. Due to the presence of a closely related native H. annosum taxon, this pathosystem presents an unusual opportunity to test specific ecological and evolutionary factors influencing fungal invasions. Comparative inoculation experiments on Scots pine cuttings and on seedlings of European and North American pines failed to identify significant increased pathogenicity of North American genotypes on European hosts congruent with lack of host-pathogen co-evolution. However, spore trappings indicate that while reproductive potential of native H. annosum was significantly reduced in the dry season, that of the invasive taxon was consistently high regardless of season. 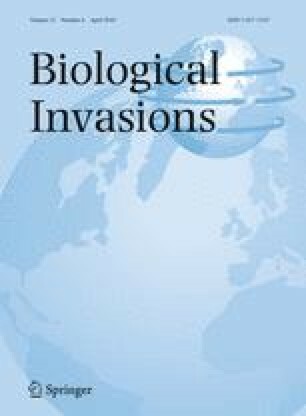 Ecological differences between the native and exotic taxon may therefore facilitate this invasion. Understanding which factors enhance this emerging forest disease is important both for biotic invasion theory and for disease control. We gratefully acknowledge Sergio Zerunian and the staff of the Circeo National Park. Thanks to Lydia Baker, Enrico Bonuso, Tami Harnik, Katy Hayden, Daniel Hüberli, Drew Linzer, Heather Rickard, Noah Rosenzweig, Amy Smith and Bret Voss for technical assistance with Experiment 2, and to Simona Ricca for technical assistance with Experiment 3. We also thank the anonymous reviewers for their constructive comments which greatly improved the manuscript. The research was partially supported by a grant of the University of Torino (60%).